Due to the outstanding success of the first “Rewind Scotland – The 80s Festival” in Perth, Scotland during July 2011, the festival returns for the second year. As with last year’s unforgettable concert performances and festivities, this year’s Rewind Scotland boasts another massive live outdoor line-up of the crème de la crème of 80s recording artists/performers. 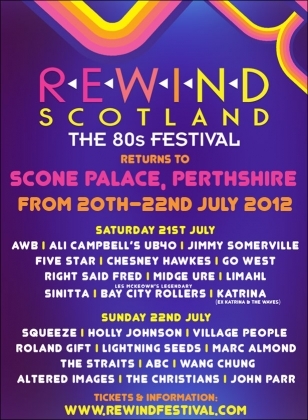 Rewind Scotland will take place from Friday 20th July until Sunday 22nd July at Scone Palace, Perthshire, Scotland (www.scone-palace.co.uk). Tickets go on sale to the general public on Friday 20th January. Details of ticket outlets and prices are available from the official website www.rewindfestival.com. Rewind Scotland Festival will once again take place at the historic setting of Scone Palace in Perthshire; home of The Earls of Mansfield and the crowning palace of the Kings of Scotland. The festival includes additional festivities ranging from Silent Discos to Live Karaoke bars along with various Camping and Glamping (Glamorous Camping) options. Look out for next week’s announcement for the full line-up of Rewind Scotland’s sister festival “Rewind – The 80s Festival in Henley-on-Thames” in August 2012.